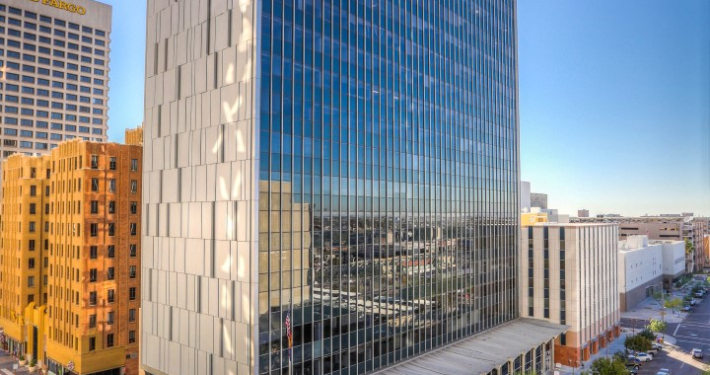 Originally constructed in 1964, this 18-story, Class A-, 255,038 square foot, mid-century modern high-rise, fits nicely into the revitalizing Downtown Phoenix Skyline. ViaWest Group purchased the building, previously known as 111 West Monroe, with joint venture partner GEM Realty Capital. The partnership has since rebranded the property as The Monroe and added substantially to prior renovations conducted in 2006, 2008 and 2014. The newest improvements focus on ViaWest’s specialty of enhancing tenant experience, with the addition of a high-quality workout facility, a 2nd floor tenant lounge that opens up to 1st Ave. and completely upgraded elevators. On the leasing front, we have added entry ready spec suites, ranging from 1,500 to 14,000 square feet. Spec suites are vital to leasing space to smaller or fast-moving tenants in the technology sector, which is quickly becoming an increasingly important piece of the Downtown Phoenix resurgence. As a result of these improvements, fast growing tech companies such as Integrate, Freshly and Solera have made The Monroe their home.